at the National Portrait Gallery. Pretty impressive for a band without a plan, they tell! 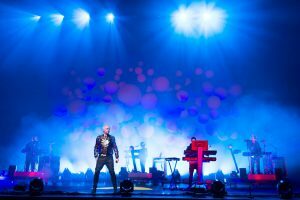 Neil Tennant recalls a friend who ran a record label telling him that the Pet Shop Boys were the start of the rot of Top of the Pops because we came on stage and didnt do anything. The Pet Shop Boys have long revelled in their difference. Its there in the album covers  in the early days, acres of white space with stark images, later superseded by bold colours, textured CD cases and inventive graphics. Its there in the intelligent, complicated riffs on love and loss. Its there in the musical forms they choose, always going against whatever the trend has been, although Lowes on-stage decks-spinning was widely copied. The current vogue for electro and electropop, which they have been experimenting with for 20 years, has meant  as Tennant puts it  that they feel the most sense of belonging weve ever had. A new book, Catalogue, brings together 20 years of Pet Shop Boys visuals: all their record and CD sleeves, videos, concerts and photoshoots. Next week, an exhibition of portraits of the pair opens at the National Portrait Gallery (a clear attempt by the gallery to attract a younger, fashionable audience), while a new album  Concrete  features the Pets performing versions of their classics backed by the BBC Concert Orchestra. Rufus Wainwright guests on Casanova in Hell, Robbie Williams on Jealousy. Its a typical genre-crossing Pets project: Planet Pop isnt their only home. In their current incarnation, the Pets  currently on a world tour  appear surrounded by facsimiles of themselves, dancers who bound around a huge coloured cube designed by Es Devlin. Tennant (as well as his many doubles) is dressed in top-hatted showmans garb and later regimental dress; Lowe (and his doubles) pouts away in lemon-yellow sports top, cap, jeans and trainers. Tennant says theyve had two distinct images  the pointy hats (first seen in Can You Forgive Her?) and the orange wigs they sported in 1999 around the release of New York City Boy. The rest of the time its really been extensions of us, he says. They started off quite tame: their first single, West End Girls, had them in white T-shirts, the second, One More Chance, in sweatshirts and jeans. In Opportunities, a more distinct aesthetic took shape: Tennant started wearing a suit and hat, while Lowe skulked like a hustler in the background. One of Tennants favourites is the cover of Suburbia, which has Lowe wearing a stripey T-shirt and outrageous Issey Miyake sunglasses. The cover of Rent has both men looking moody in a pool of light on a deserted railway platform. I think its fiercely heterosexual myself, deadpans Lowe, but in retrospect its amazing that in 1994 Tennants coming out was any news at all: the images, plus all those lyrics about longing and self-denial, make it all seem so obvious. Tennant explains that, besides the beautifully shot imagery (Derek Jarman directed a few of their videos, beginning with Its a Sin in 1987), the intention was to make their songs narratives, so the titles acquired inverted commas and full stops. Being Boring is an aching, elegiac poem to times past and lost loves ones that also, says Tennant, confronted the cliché of the Pets as boring with a song that was anything but. For the picture that graced the cover of Its a Sin (shot in the sacristy of Christ Church, Spitalfields), Tennant was inspired by Sickerts painting Ennui. They invited the architect Zaha Hadid to design sets after Tennant fell in love with models of her designs for a railway station. The Pets have worked with Sam Taylor-Wood, Bruce Weber and Wolfgang Tillmans, though sifting through the many jewels in Catalogue and the NPG exhibition the most memorable images, playing with sexuality and anonymity, have been taken by Eric Watson. For a time in the late Eighties they became known for working with icons such as Dusty Springfield and Liza Minnelli. Who would they like to work with next, having just produced Robbie Williams and Kylie? Chris would like to work with Randy Crawford. For me, Stevie Nicks, says Tennant. Lowe seems quite chatty: does he just pretend to be the sulky one? No, it isnt a pose, he says tightly. Does he hate being in the public eye? Yes. Thats why I wear all the disguises, he says, looking as if he is chewing glass. Lowe just hates being looked at. I always tell the lighting guy not to put lights on me. Im furious if they do. Im not the singer. Why do you think weve got a cube of flashing lights behind us? But that doesnt help to hide them: a dancer once said to Tennant that despite all the diversions  films, lights, insane costumes, the dancers  all they [the audience] do is look at you. Lowe grumbles that he doesnt have a love life, to which Tennant guffaws  Thats rubbish. A blatant lie  adding that he wouldnt take advantage of the new gay partnership laws. Id only marry for the money, Lowe says, with a dirty leer. What are their remaining dream projects?